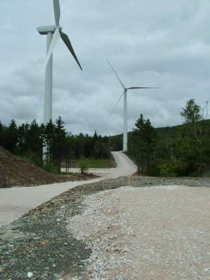 Newly-installed turbines in the Hoosac project. Photo by Ellen Landauer. Marie Stamos of Quincy gave her time at the hearing before the Joint Committee on Public Health to allow others to testify for H2032. The comments she had prepared are excerpted below and the full statement is available here. Today, before you, you have many people who have suffered without acknowledgement or relief from the health impacts caused by the industrial wind turbine. Present, today, are but a few compared to the number of victims in our state of Massachusetts and, actually, across this country and around the world. We were thrilled with the thought of free wind, the modern day wind mill. The wind turbine which made sense then does not today. Today we understand that there are proven health issues that must be researched fully to enable proper siting with no negative impact to human health or quality of life. We did not know or appreciate that the industrial wind turbine was and is, in reality, an industrial machine that would industrialize rural and residential neighborhoods and that it would not be, could not be depended upon or relied upon to prevent the furtherance of climate change. The climate change issue is much more complicated than one simplistic answer, renewable energy.